Time stood frozen for the humans who had ventured into the realm of the Fae. The angry one said we do not matter! Kill him…kill him! Lord Herne, the lord of the goblins, and his daughter Eolande stood before Meadhbh, both focused on the swollen roundness of her torso. Her belly was split open, a gruesome gift from the blade of King Diwarnach, and she was pale from the loss of blood. Her father gave her an amused look as Eolande’s frown turned into a pout. Meadhbh sheathed the blade she had been sharpening, turning her gaze upon the thin, blonde girl in front of her. The girl had guts coming to her at least, and Meadhbh couldn’t say that she disliked Addiena verch Cadern, but Bradan was difficult to deal with, and she wasn’t sure the girl knew what she was getting herself into. Still, Bradan had sent Addiena with specific orders to learn how to fight from his sister, and Meadhbh knew she would have to relent and take the hopeful one under her wing. Hopefully she could scare Addiena away before the girl got herself killed. One second later, Addiena was hunched over on the floor, holding her gut. “Wh-what…” she wheezed between wracking coughs. Two seconds later, Addiena was on the ground again, reeling from a brutal kick to her right leg. Meadhbh sighed. “Well, you dodged the punch. That’s something at least.” This is going to take a while. Two hours later, Addiena was covered in new bruises from repeated failures to dodge the onslaught of punches and kicks. But Meadhbh noted with approval that the girl was getting faster, even as she landed a jab that bloodied Addiena’s nose. Meadhbh called an end to the practice, and began mopping her hand of Addiena’s blood. “Go clean yourself up and be back here tomorrow at the same time.” As Addiena tottered away gingerly, Meadhbh shook her head, thinking to herself, She won’t be back. Meadhbh was surprised as the next day, Addiena was waiting for her in the training area. And the day after that. Never late, never complaining. What the girl lacked in ability, she made up with tenacity, and as the days went by, she became faster and more confident. Meadhbh grudgingly admitted to herself that perhaps she had misjudged Addiena. Maybe she would be able to handle Bradan after all. Meadhbh chuckled as she realized the foolishness that had just crossed her mind. Addiena still had a long way to go. Meadhbh verch Cadell was annoyed. To be fair, that seemed to be the normal emotional state with the fiery redhead as of late, however this day her annoyance had climbed to a new level. The near-constant awareness of the packs of wolves roaming the countryside had begun slowly scratching away at her sanity. She could not rid herself of their presence, even while she slept. And worse yet, the wolves seemed to not be as bothered as she was by the unnatural connection. Some of them would even loll their tongues out in canine laughter at her whenever she managed to catch a fleeting glimpse of them. Meadhbh was far from a solitary person, however everyone had their limits. And she had just about reached hers. So when Baron Owain ap Edern had called for a feast to celebrate the devastating victory over the Irish and Meadhbh would be expected to be in attendance AND she was not allowed to join the hunting party that had gone out in search of game? She decided that while she might be miserable, she could at the very least make as many other lives nearby as miserable as she. She snapped at just about anyone who came near all day long, even going so far as chasing her brother Marcus out of her room with a sword and a string of curses when he stopped by just to say hello. “Oh for all that’s…what is it now?” Her mood darkened once again as she turned around, only to find one dark-haired warrior staring her down from several yards away. He held a large cup in one hand, and he was grinning from ear to ear. -ge. Morgan brought his sword down in an overhead sweep and Meadhbh parried the attack and kicked him away and into the mud. Morgan, still not willing to concede defeat, hauled himself out of the mud to continue the duel. Morgan grinned wolfishly at Meadhbh. “I could be wrong, men, but, I think I’m starting to wear her down!” Raucous laughter echoed around them as Morgan approached her once more, sword held ready. Meahbh’s vision focused down to a pinprick of light as the wolf sense cut through her like a blade. She saw only a brief flash of auburn hair, but the worst was the intense pain, followed by anguish. The sound of a wolf’s cry of pain echoed through her head. Meadhbh blinked as her senses returned to the present, only to find the courtyard had fallen deathly quiet around her. She looked down at her hands, now empty, then glanced over several yards away where her sword lay in the mud. Before her stood Morgan, staring down at her over the point of his sword. The sea of faces around her registered shock, all of which was directed at her. Morgan’s voice rumbled out drunkenly. “M’lady. I do think I’ve won.” Morgan ap Rhys, the man who defeated the Lady Goldeneyes in armed combat, then turned and walked a few paces away before emptying the contents of his stomach in a nearby shrub. Meadhbh huddled over a makeshift fire, her back facing the wind that howled through the forest around her. The small flame had already been extinguished by the wind and lack of dry wood more than once, and this one threatened to die as well with every frigid gust. She shivered as the cold had begun settling in her bones, and she knew that she needed to find better shelter, or even better, the rest of her hunting party, or she would not make it home. The winter had been especially hard on her clan, and a desperate need for food had forced their hunting parties farther and farther away from Bryn Euryn in an effort to hunt game. Just that morning, they had all given chase to a scrawny looking deer, but in the unfamiliar territory, Meadhbh had lost her way. A long, low howl sounded through the forest, and Meadhbh’s head snapped up, the lull of the cold temporarily forgotten. Shortly thereafter, another howl followed, and then another. Wolves. She stood slowly and hefted her spear with her stiffened fingers. Her fire gave one last pitiful flicker, and died at her feet. Her breath puffed out from grayed, chapped lips in the twilight darkness. Another howl, this one much closer, echoed across the small clearing. In the fog of exhaustion, Meadhbh did not realize that she was running for several moments. A thought drifted upwards, what am I doing? I don’t even know where I’m going. But she didn’t stop. Her panicked flight through the forest was cut short by an errant root that caught her foot, sending her sprawled face down on the ground. She briefly tested her ankle and found that miraculously, she had not injured herself in the fall. She started to stand to hunt for her spear, then froze. Not ten yards away, a pair of glowing, golden eyes shone out from the darkness. The eyes blinked slowly, then were joined by two more pairs of similarly golden eyes. The eyes loped closer until the shapes of large gray wolves formed around them. The largest of the three shadows snarled. I am dead, Meadhbh thought. Better to go out in battle, but my spear…I am so tired. Where are the other nine? I only see three? Meadhbh blinked. 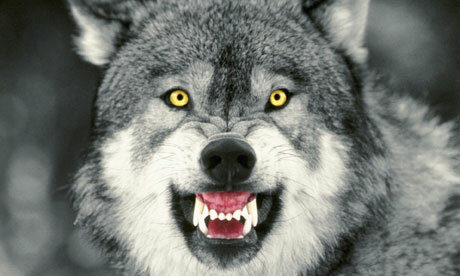 The largest wolf had ceased snarling and was regarding her quizzically. Meadhbh held her breath as the beast sniffed the air and began circling her slowly. The wolf turned, his tail wagging ever so slightly. He stopped as he nodded once towards a small footpath. Meadhbh stood and took several tottering steps down the path. The wolves left her then; she didn’t even need to see them go. She knew. She could feel it. A low howl was the only response. Merasiel inhaled deeply as she and her companions emerged from the tunnel beneath the island. She lifted a hand to shield her eyes from the bright sunlight and breathed over and over again, forcing clean oxygen into lungs that had been still for too long. Her senses were alight with colors, a harsh contrast to the hazy gray dullness of the underworld. The rippling blue of the sea sparkled and caused pinpricks of pain in her vision as her eyes adjusted from the darkness back to the light. 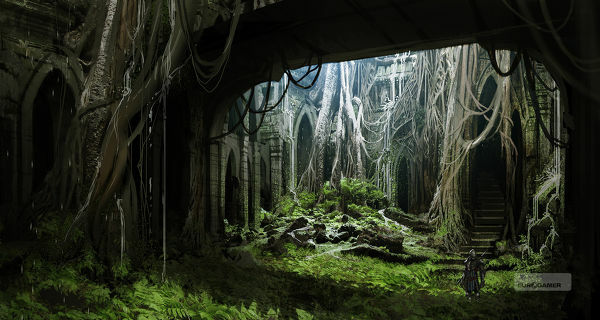 The dusty browns and grays of the ruins around them mingled with whatever green overgrowth had taken over the buildings. The familiar tang of the sea teased at her nostrils. She squinted up at a sky pockmarked with puffy white clouds, and took several long moments to process it all. Her thought was interrupted as the cry of a sea bird echoed across the island. Her sharp eyes caught sight of the creature quickly and followed it on its journey. It twisted and twirled in the eddies of the wind and eventually dived low to the water, beyond her field of vision. He barely noticed the noise of the city around him. Shopkeepers hawked their wares in his direction, but he paid them no heed. His feet carried him forward against his will, and he ignored every passerby that brushed up against him. He probably had been pickpocketed a dozen times over, but he didn’t care. The cold, iron knot in pit of his gut dulled his normally sharp, Elven senses. He didn’t want to go back to the inn. He dreaded the coming discussion with every fiber of his being, yet he could not find reason to tarry any longer. She waited for him there, he knew. Once again, he cursed his stupidity. Mendelel replayed his own part of the conversation mockingly in his mind as he walked. “I found them! There are survivors, and one of them is a scout in the forest outside the city!” He let out an angry snort. I shouldn’t have said anything until after I knew more. All too soon, his feet carried him to the inn, and he looked up to the window of her room, his eyes meeting her anxious gaze. What is keeping him? If he got himself pickpocketed again…wait, there he is. But something’s wrong. Merasiel glared out the window, her expression barely concealed behind the foggy glass pane. Mendelel’s usually jolly countenance was missing. The corners of his mouth turned downwards in a frown, and his normally springy step had been replaced by a slow, plodding walk. “Something is very wrong”, she murmured, and bolted from the window. Merasiel’s grip fell slack, and she sank down to the steps. She couldn’t conceal the look of shock on her face, and in one swift movement, Mendelel seated himself beside her, an arm wrapped around her shoulders in support. “His daughter?” she asked quietly. “Mera—” he began, but Merasiel hushed him. “It’s alright. It’s like you said. It has been nearly a thousand years. Anything could have hap…” she faltered, no longer trusting her voice to continue. Merasiel maintained her calm expression and nodded, but within, she was a torment of emotion. I want to die. Why didn’t I die? Why? The cry of the sea bird once more caught Merasiel’s attention. She watched it for a time, and when it flew out of her line of sight again, she noticed she was alone in the ruin. Far below, she saw her companions, all of whom had already begun the long trek down to the Gleaming Endeavor. The stout-hearted Northman, the Fool, the Priest, the Swordmaster, the Archer and the strange Mage. All of them cast long shadows as the sun began sinking towards the horizon. One could not find better companions to live…and die with. Merasiel picked up one foot after the other and began the long descent from the ruins after them, her mouth parted wide by a genuine smile. Deep within the bowels of the Vasar hive Ri’Tal, Merasiël, Gabriel and Dane wandered among strange company. The Huallapan they had freed a short time ago now led them unerringly through the endless maze of tunnels that seemed to continually twist and turn back on themselves at random. Merasiël occasionally glanced at the silent people, her unease very apparent. Despite the events of the earlier fight, Merasiël still distrusted them; how easy would it be for the liberators to be abandoned in the tunnels and left hopelessly lost, or worse, to be turned over to the first Vasar patrol they encountered? Yet, none of the others shared her concerns. Gabriel followed along in his usual easy stride, and Dane ghosted along behind them, his bow ever held at the ready and an arrow nocked. The few remaining Crusaders that had originally joined this mission were scattered throughout the growing pack of Huallapan. Those who were too wounded to continue had been sent back in search of the way out. There are so few of us left. Even if the Huallapan do not betray us, what good will all of these empty hands do? Merasiël had little faith now that they would succeed, but Dane insisted that his plan would work. And so they pressed on. Occasionally they would be brought up short by a motion from Eli, the Huallapan who had overcome his fear and rallied the prisoners to action. After a brief conversation with Gabriel, he would send a pair of armed Huallapan down a side tunnel. A few minutes later, they would return, accompanied by more prisoners. Merasiël grated at each delay, however her protests were largely ignored, and they continued at their slow pace, freeing more and more prisoners as they went. As those in front of her stopped abruptly once more, Merasiël expelled a frustrated sigh. She elbowed her way to the front where Gabriel, Dane and and Eli stood. Upon reaching the front of the group, she saw Eli gesturing at some sort of ventilation shaft in the side of the tunnel. From what she could tell, it was wide enough for a single person to pass through at a time and seemed to lead upwards at an angle. Gabriel scratched his chin and stared at the small entrance, a somewhat bemused look on his face. Eli continued to speak hurriedly to him, gesturing more than once at the portal. “What is it?” Merasiël asked when she was within earshot. Merasiël shook her head. She had not bothered to learn any of the Huallapan language, believing it too rough for Elven tongues to bother with. She turned and dropped down to a crouch before the the shaft entrance and muttered in Elvish, “That will be a difficult climb.” The walls were smooth and waxy, just like the rest of the tunnels, however the angle wasn’t too much to climb if one were careful. She buried the rest of her complaints, dropped to her hands and knees and disappeared into the small passageway. A soft grunt from behind let her know that the others had joined her in the slow, painful ascent. The silence was marred only by the sound of feet, hands and knees gaining purchase in the tunnel behind her, heaving the men onward. The sounds paused, and Gabriel’s voice drifted from just behind her. “Lovely view in here,” he murmured, amusement fairly dripping from his voice. Dane’s soft laughter drifted from below Gabriel’s feet. Merasiël stopped and glowered over her shoulder at them, beginning to suspect some sort of joke. Gabriel’s knowing smirk and brief glance at her posterior was all she needed to see and she turned back to her task. “Very funny,” she said, without a trace of amusement. After several minutes of climbing, the dim light around them lifted as daylight filtered down from the end of the tunnel. Merasiël turned to look over her shoulder once more, a finger placed on her lips to caution the others to silence. She wormed her way up the last few feet to the end and found herself peering out of a grate into an large, open courtyard. As Eli had promised, she had a clear view of the main gate and the mechanism to open it. She also had a clear view of the large number of Vasar guards swarming the courtyard in between themselves and the gate. An iron fist clenched in her gut. We must continue, for good or for ill, she thought grimly and tested the grate, only to find it locked. She twisted herself around and planted her back against one side of the tunnel and her feet against the other to hold herself in place, allowing her hands the freedom to begin working the lock open. The tell-tale sound of the lock opening seemed loud to her ears, and Merasiël froze. A glance out the grate showed that none of the nearby guards had heard. In fact, she saw that there were now fewer guards in the courtyard. Much fewer. Many were leaving swiftly, accompanied by the sounds of angry clicks and snarls, but couldn’t see where they were going. But now, the way to the gate was clear. She felt a tap on her boot, and she looked downward at Gabriel. One by one, they scrambled out of the tunnel and tumbled into the courtyard. Merasiël immediately sought some sort of cover, praying to the Eternal that they had not been noticed. Whatever diversion the Halluapan were causing was working, and all of the Vasar eyes were turned elsewhere. “Dane? Are you ready?” Gabriel asked curtly. Dane had already returned his arrow to the quiver on his back and had withdrawn a new one, the point of which was wrapped in cloth and coated with oil that would burn in a bright flash. They would give a signal to the army camped outside that they were in the courtyard and would open the gate soon. Dane nocked the arrow and took aim as one of the elves lit the cloth with a spark from a flint and tinder. Outside the gate, the Crusaders waited. 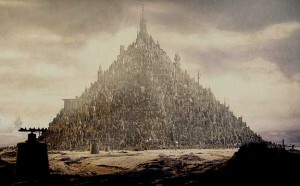 Rainald, Magnifico and Brother Mendel stood just ahead of the lines of warriors, their eyes trained on the Hive walls. The setting sun made it difficult to see, but they shaded their eyes as best as they could and continued to keep vigil. “Is strong, yes,” Rainald agreed. Within the hive, Merasiël kept to the shadows as much as she could and moved swiftly to the gate’s locking mechanism. Their time was short, she knew, as the Crusaders would begin their march as soon as the signal was sent. Dane’s arrow, while bright enough to be seen by the approaching army, was also bright enough to alert the Vasar that something was amiss. In the confusion, she and one of the other elves with them were able to reach the gate and begin the slow process of opening it. The sounds of fighting broke out behind her, but she tamped down the urge to join them and stayed at the gate. She heard the elf next to her cry out in pain and she then realized that she was alone. He lay in a pool of blood by her feet, felled by a hurled vasar glaive. But still, she worked the gate as quickly as her strength would allow. A black blade nicked her shoulder and she stumbled to the side, narrowly avoiding a thrust through the center of her back. A huge Vasar towered above her, poised to deliver a spear strike into her heart. Instead of delivering the killing blow, however, it shuddered oddly as the tip of a rapier thrust through its body, and the spear fell to the ground with a clatter. Merasiël heard the song of the Crusades echoing over the wall. The army would be at the gate in moments. “Merasiël! Get that gate open!” Gabriel called out as he turned away, holding his blade ready. He joined Dane to stand against a large, writhing black mass of Vasar. With as much effort as she could muster, Merasiël threw herself on the mechanism and forced it to move. As the gate opened, a blow from somewhere behind her left a loud ring in her ears and a film of hazy darkness roiled around the edges of her vision. The last sight she saw was that of Rainald barreling through the opened gate, bellowing his trademark, blood-curdling war-cry, and then everything went black. Merasiël stirred as voices disturbed her slumber. Her eyes flickered open and her vision swam as she focused on Brother Mendel and Gabriel standing nearby. No, not standing, lying down? Are we dead? Not dead, then. Merasiël smiled at the idea of Gabriel’s discomfort, but the effort sent pain shooting through her head and she groaned. “What happened?” Merasiël forced her eyes to focus on the two Mendels that swam before her. Mendel glared over his shoulder, but Gabriel was spared the priest’s rebuke by the tent flap flying open. Rainald entered, Radskyrta’s arm draped over his shoulder as he drug the warrior to one of the empty spots beneath the tent. Radskyrta’s leg was twisted at an odd angle, and it didn’t seem to be working properly. Both of them were covered nearly head to foot in insectoid goo. “Hah! Yes, lítillbróðir! Killing much bug-mans today.” With that, he departed, the tent flap snapping closed behind him. In the days that followed, the Crusaders solidified their hold on Hive Ri’Tal as the last of the Vasar that hid in the tunnels beneath were flushed out. The Huallapan that had provided the distraction that allowed the opening of the gates had suffered grievous losses, including the brave warrior Eli. There was little time for sorrow or rest, as the Crusaders soon turned their sights on the last of the Vasar strongholds. 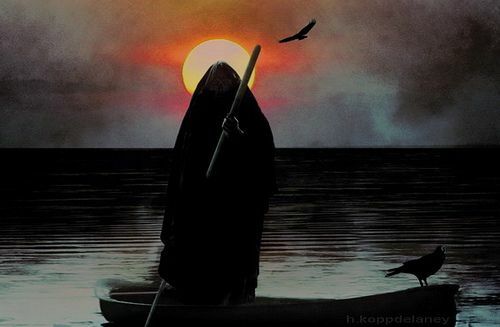 The command rang through her mind, but around Merasiel the only sound to be heard was the drip of water as the ferryman’s pole broke the surface of the pool, propelling them onward. Mendel had ceased his mad rambling, and the rest of her companions were silent, each of them lost in their own thoughts. Merasiel clutched her remaining dagger in her hand, replaying the battle in her mind many times as she sought a different outcome that would have prevented them from this hell. As much as she considered each misstep, once again Gabriel’s command echoed in her ears and she flipped Angrist around hilt first and returned it as he requested. She felt again the keen loss as the weapon left her care, but she reminded herself that the dagger was not hers to keep. Once again, Gabriel and Gestlin never surfaced from the water. Once again, Magnifico fell, then Dane, Mendel and then herself. The Northman outlasted them all, but even he was overcome in the end by the creature that would not die. In the midst of the fevered battle, one of her own daggers had been knocked from her hand and disappeared into the depths of the pool the hydra-creature had called home. It had not made the trip with her into the afterlife, and she mourned. 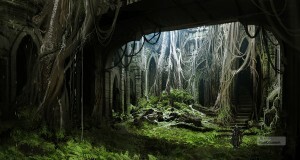 The still of early morning in the Elven city of Estrelere was broken by the hurried arrival of a scout from the north. Merasiel usually slept lightly and would seek out each scout that returned, anxious for news of orc movements in the area, but for once, exhaustion caused her to miss it. She had worked late into the night with her daggers, and had fallen into bed well after the midnight hour. She awoke in an instant, however when the door to her chamber opened. She blinked a couple of times as her vision came into focus on Lesthial, Elder Oronthil’s wife. Merasiel opened her mouth to wish her a good morning, but froze at the expression on Lesthial’s face, her greeting held prisoner on her tongue. She stared at Lesthial expectantly, and eventually the purpose of the early morning intrusion came to light. Merasiel arose and began to dress hurriedly, the familiar scowl settling on her face. “What is it,” she stated, already suspecting that the news was not good. Merasiel heard no more. She finished dressing, and left the room at a run. The scout was in the main chamber still, head bent in whispered discussion with the Elders. His head was bloody from an injury that had yet to be tended. All heads looked up and conversation ended when she entered the room. The silence screamed in her ears. The scout approached her then, grief resonating from his every movement. When he lifted his hands to her, she saw what he carried: a bloody belt with a pair of sheathes attached. 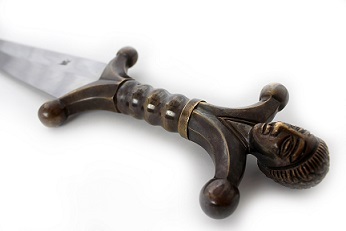 From the tops of the sheathes, the pommels and hilts of a pair of matching daggers could be seen. My mother’s, Merasiel thought. She always said that one day they would come to me. Merasiel’s sorrow never showed outwardly, but her hands trembled as she took the precious gift. All that remained of her parents lay in her outstretched hands. The ferryman’s boat rocked gently as Merasiel’s thoughts returned to the present. She gripped the dagger more tightly than she realized, yet she felt nothing. And why would I? I am dead. She slipped the dagger into her boot, taking great care to secure it so that it would not fall out, and then instinctively shook out her hand, silently musing over the absence of the expected pins and needles sensation. Across the boat, Mendel had begun to ramble again. The jolly priest had ever been a source of comfort to them all, bringing healing and light to dark places. He rarely lost his temper, and to see him in this state caused her some concern. For a brief moment, Merasiel’s mask crumbled, and the sorrow she had buried for her family, and her people, for so long showed starkly on her face. And then just as suddenly, the mask returned, the lines on her face smoothing themselves back into the soft frown that marked her aloofness. “Thank you for the gift, Gabriel. I will ensure that it’s taken care of.” With that, she slipped Angrist in the sheath on her belt. As the snap of the hilt meeting the top of the sheath met her ears, she considered the gift of something so precious and her concern over the state of those around her. While she felt no less dead, she felt comforted in the company of…..friends. Bits of crumbling stone pattered softly to the ground. Merasiel shook her hand to remove the fine white dust that remained after she had brushed her fingers against the ruined wall. People once lived here, she thought to herself. Many people. And died, apparently. The thoughts brought little emotion, and her attention was easily diverted by a continuous drone of words. Merasiel sighed and tuned Gestlin out again. All of the years she had lived had given her ample opportunity to see places that were once vibrant and alive be pillaged of their souls and left to stand as mere shells and a stark reminder of what was, and could be, lost to time. They ceased to interest her. Sometimes she wondered if she should be counted among those ruins. She brushed her fingertips gently against another section of wall and a faint cloud of powder puffed away into the air. More small bits of stone crumbled to the ground and lie still. The only sounds to be heard in the Great Forest were those of night beasts and their unfortunate prey. Somewhere above, an owl sang from the darkness and Merasiel looked upwards into the canopy. The forest had always had a wild element to it, but this was different. It was too wild. Too untamed. Merasiel’s expression assumed its natural state: a frown. Mendelel and she had completed their service to the humans who had been responsible for breaking the spell that held them locked away inside Mortuturesihad. In gratitude for their freedom, the pair had agreed to forestall their return to Elven lands to aid the humans’ Lord Wallace in his Crusades. Somehow they had defeated the Vasar, driving them from the Huallapan lands. And now, Merasiel and Mendelel were free to resume the lives they had once led. Only, Merasiel had heard nothing of Estrelere during the crusades. The humans who served had never ventured into the Forest and knew nothing of her home. The elves who had joined the armies were all from Sylvilara, and if any of them knew anything, they remained silent. Merasiel’s frown deepened, threatening to become a scowl. “Don’t look so sour! We’ll be home tomorrow.” Mendelel looked up from the campfire and Merasiel met his gaze. His face glowed red in the firelight and he smiled. 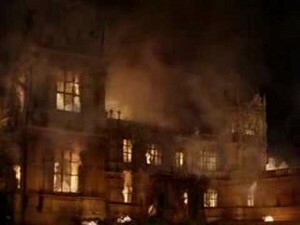 “Home,” he repeated, then looked back to the fire he tended. “Stop. I understand.” Merasiel looked as though she wanted to say more, but instead she drew her rough cloth blanket around her shoulders and settled down to sleep, ending the discussion. Sleep wouldn’t come, though, and her mind twisted alternatively with hope that she could resume the life she led before, and fear that she would never be able to do so. Time will have changed him. Time will have changed them all. How many of those I knew will still be there? In the gray light of early dawn, the pair cleared their camp and shouldered their few remaining belongings. No words were spoken; Merasiel had not slept well and was in more of an ill temper than usual. Mendelel had become accustomed to his friend’s dour moods and wisely avoided discussion with her. As the morning drug on, Merasiel’s disquiet grew, and when they stopped for a midday meal, Mendelel appeared just as concerned. “We should have seen a scout by now,” he said quietly as they packed up their belongings. Above them, a raven cawed. “This is wrong.” Merasiel said, then picked up her backpack and took off into the forest at a brisk trot. It took Mendelel a few moments to catch up with her and they glided through the forest, their dread growing with each passing moment. When Merasiel stopped suddenly, Mendelel nearly collided with her. He twisted awkwardly and fell to the ground, nearly smashing his head on a stone. Merasiel barely registered this, her attention completely focused on what lay before them. An uneven, moss-covered stone road cut through the overgrown forest, visible in patches beneath fallen limbs and bushy undergrowth. What did show of the roadway was even worse: individual pieces of stone were missing or chipped, and the road had obviously fallen into disrepair many years ago. Several yards away, only just visible in the thick of trees, stood a partially collapsed ruin that once was an archway marking the entrance into the Elven city of Estrelere. Merasiel took a hesitant step forward, then another and another before breaking into a full run. Somewhere in the back of her mind, she distantly heard Mendelel shout a warning, but she would not stop. She ran along the broken road, jumping over tree roots that had encroached upon the stone, until her feet carried her into the city proper, or what remained of it. She turned in circles, her eyes shifting from one destroyed structure to another. The forest had long since reclaimed the once vibrant city. Full grown trees twisted around broken, collaped buildings, and thick brown vines twined their way to gaping rooftops and beyond. 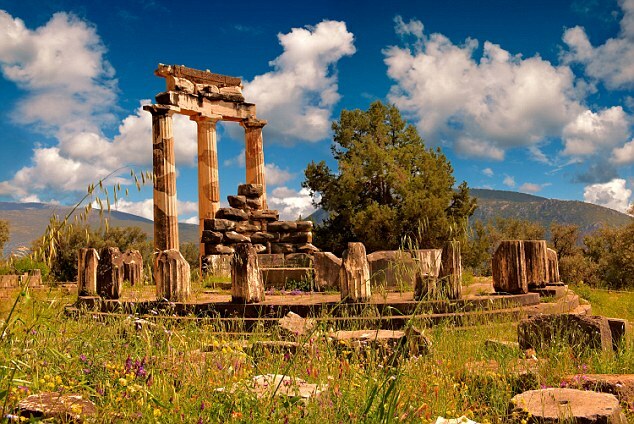 Where once there were statues, gardens and carvings, only crumbled stone and wild growth remained. Mendelel once again caught up to her as she fell to her knees, overcome by grief. Her face was hidden, masked by her hair and upturned hands, but she shook, and a single sob came from her bowed head. Mendelel sank to his knees next to her and lay a hand on her shoulder. They remained there for a time, the only comfort to be found in each other. The sound of Mendelel’s voice whispered softly from behind her. It shook with a great sadness and she lifted her hand to her shoulder and gripped his tightly. Mendelel’s voice faded and once more they were consumed by silence. Merasiel released his hand and stood, her expression stony behind the tracks of tears down her cheeks. Somewhere within, sorrow was devoured by rage, and the silence of the ruins was shattered by her inhuman howl of defiance against the fate that had claimed their home. O Estrelere, light of the sun. Light of the moon and stars. In a time of darkness! Dance and song no longer grace your ways. The winter assault on the second major Hive had been a test of Merasiël’s patience. The colder weather had sent the Vasar into inactivity, so the few skirmishes that had been attempted had been repelled with little effort. Unfortunately, the Crusaders could likewise gain no ground against the massively fortified colony, and instead they settled into a long siege that went on for several months. As winter melted into spring, the crusaders finally gained an advantage in the form of reinforcements and supplies. The Huallapan people who had been freed so far found new hope and bravery in the form of the soldiers from Yrth, and rallied to join the cause to drive the Vasar from their home world. Merasiël was glad of this, but not for any altruistic reason. She grew tired of the wait and wished to complete her service to the humans so she could disappear back to her homeland with Mendelel. The addition of the Huallapan to their army gave Dane the resources he needed to finally wrench the Hive from the control of the Vasar. Instead of a costly full assault, however, they opted for stealth. Three parties were sent, led by Gabriel, Merasiël and Dane to the service and ventilation tunnels beneath the hive in search of the main gate, which remained ever closed to the main army. Merasiël wiped her cheek with the back of her left hand once she had assured herself that the creature she fought was dead. Its eye had popped with an explosion of opaque yellow liquid when met by the point of her well-aimed dagger. She frowned deeply at the wet stains that now decorated her leather glove, but after nearly a year and a half of fighting the accursed Vasar, she no longer was disgusted by the insectoid remains that seemed to coat nearly everything she owned. She idly shook her hand, not really caring whether or not it dislodged the latest bit of scum. These creatures bled, just like orcs. It was good enough. “What now?” Mendelel’s whisper drifted softly into her ear. She glanced over her shoulder at him and nodded once. She lifted her hand and motioned to the remainder of the Elves that followed behind her. The bodies of the Vasar guards that had stumbled upon them were left where they fell, and Merasiël led the way deeper into the dark halls of the Vasar Hive, keeping whatever shadows she could find close at hand. The smooth, waxy walls were confusing to the senses. They all looked exactly the same, and many of them indeed circled back upon one another, leaving the raiders disoriented. It was Mendelel who saved them that day, using his dagger to carve symbols into the walls at each juncture they passed, marking the paths they took. Merasiël realized after the third time they encountered his hastily scribbled arrow, they would have been hopelessly lost inside the winding tunnels otherwise. A few steps in front of her, Mendelel drew up short and crouched next to a corner. He held up his hand, motioning for silence, and as one, the Elves melted against whatever cover they could find. Merasiël found herself hidden beside him, and her ears soon picked up the noise he had heard, the sound of approaching stealthy footfall. Someone is trying to sneak up on us, she thought. How cute. She drew her dagger, and waited for the shape to draw nearly abreast of her hiding spot before launching herself from the shadows. Her intent was to kill, but she found nothing but steel as the shadowed figure parried her attack. She had only a moment to register this before the dagger was wrenched from her hand in a flourish of white, and the sound of soft laughter met her ears along with the clink of her dagger hitting the floor. Despite their meandering path, they encountered no other guards other than dead ones that Gabriel and Dane’s group had dispatched. They quietly followed the string of Mendelel’s symbols, choosing different paths when the ones they were on circled back around on them, even backtracking a time or two as it became necessary. After an hour of walking, the light changed, growing brighter. Finally, Merasiël thought, We can be done with this place. Her hopes faded into another scowl, however, as they rounded a corner and they discovered not the main entrance to the Hive, but a brightly lit chamber instead. 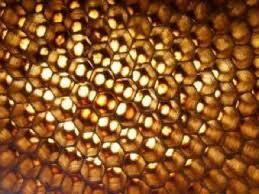 She realized with a start that the light was natural light; sunlight filtered through small, hexagon shaped holes high in the ceiling, leaving a hazy, honeycombed pattern on the floor. As their eyes adjusted from the dimness of the tunnels, they realized they weren’t alone. Dozens of haunted eyes stared back at them, the shafts of light casting an eerie glow over the gaunt faces of Huallapan who had been taken as slaves and put to work deep within the hive. 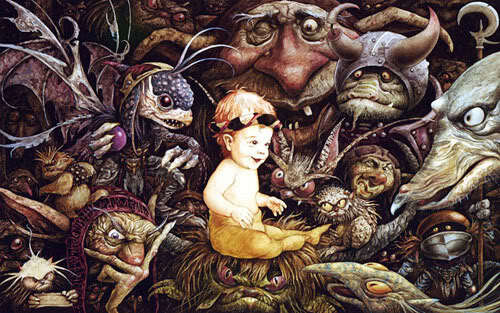 Great, more mouths to feed, she thought, as Gabriel approached the Halluapan, speaking haltingly in their language. At first, they seemed surprised by his speech, and some of them lifted their arms and extended skeletal fingers towards the warrior. A sharp warning from within the crowd brought them up short, and they all scuttled away to the opposite side of the chamber, whispering among themselves. “What are they saying?” Mendelel nodded towards the prisoners. “It’s hard to say; I’m not fluent in the language, but I think they think we are sent by the Vasar to trick them and kill them.” Gabriel once more spoke the Huallapan tongue, his words stumbling out slowly. The dissenting voice from earlier cut him off mid-sentence. As she turned to hunt for another tunnel out of the chamber, a wet thud and a sigh echoed from the tunnel they had come. One of the Elves that had remained there to keep watch was dangling from a Vasar spear that protruded from his chest, his already dead eyes staring at her in accusation. A crowd of Vasar guards emerged from the service tunnels behind the Vasar that had killed her kinsman. Merasiël’s dagger flashed in the beams of light as one of the Vasar charged towards her. It was too late for stealth; she would have to depend on her speed and cunning to survive this. She was dimly aware of the twang of bowstrings as arrows were loosed nearby. Mendelel and Dane, perhaps others were busy peppering the twisting black mass of insects with well-aimed arrows. And still the bugs continued to flow from the tunnel. A deep breath. Wait for it….Now. The Vasar’s strike was more swift than she expected. She sidestepped, but the blade caught the edge of her leather sleeve, and a red haze of pain crossed her vision. She shook it off and used her foe’s over-reach against it, burying her dagger to the hilt in an area of soft flesh on its torso. She felt the flow of bloody fluid around her fingers, and the insect toppled over. She was lucky this time, but how her arm burned. Merasiël fell to the ground as a sickening crunch sounded out above her. She glanced up to see that Gabriel’s foe had been wielding a rather nasty spear which was now impaled on the Vasar she had been fighting. Merasiël flipped herself around into a kneeling position and once again, buried her dagger in a chink between the chitin plates of the remaining guard. A long cut let loose a flow of ichor, and both foes lay on the ground. Across the room, Mendelel called for help. He had been cornered by a pair of Vasar and was hard pressed to avoid their attacks. Merasiël sprinted across the room towards him, but never reached his side. A black shape reared up beside her and took a swipe at her leg, opening up her armor and a fresh haze of red overcame her vision. She fell to the ground, and her dagger flew from her grasp, skittering across the floor and out of sight. She rolled over on her back, her head beginning to throb. A large insect loomed over her, its spear raised to impale her to the floor. Surprisingly, the creature never attacked. It merely shuddered once, and then fell over to the ground. Merasiël stared in bemusement as a much smaller figure came into focus. Huallapan. He stood there, unarmored, barely clothed and certainly weak from malnourishment and extended captivity. But somewhere he had found the courage and strength to take one of the weapons of a fallen Vasar and fight. He offered a hand to pull her to her feet. A few minutes later, Merasiël looked over the last Vasar corpse. It had been battered beyond recognition, and seemed to be most decidedly dead. Still…she stabbed the creature between the eyes, just to be sure. It didn’t even twitch. As she unbent her knees and stood to her full height, she took a moment to gather her wits. The fight had been particularly rough on them. Merasiël nursed a deep cut on her arm and leg where her foes had managed to pierce through her armor, and more than one of her kin lay gravely injured on the floor. Brother Mendel will be busy this night. She assisted where she could, but she did not linger over anyone longer than necessary. Nearby, Dane checked on his injured men, readying the ones that could move or be moved while the healers that had been brought tended to those who couldn’t. She gradually became aware of Huallapan speech from across the room, and as she sought the source she noted that one by one, everyone else turned to observe. Gabriel stood a mere foot away from the prisoner who had taken up arms and slain one of the Vasar. The prisoner still held the blackened, barbed blade in his shaking hand as he stared downward at the blood of his enemy that pooled on the floor. Gabriel spoke quietly to him, and the man tore his eyes away from the pool of blood to meet Gabriel’s intent stare. What he saw there steeled something within, and the Huallapan nodded once, his knuckles turning white as he grippped the blade more tightly. He then slowly turned towards his fellow prisoners, lifted the bloody blade and he began to speak. The words came difficult at first, raw emotion robbing his voice of power. “Huallapan. Sung….Sungunaka. Sungunaka*!” As the words flowed from his tongue over and over, they gradually gained strength and others detached from the shadows, their voices joining him in his cry. Soon all of them were there, clamoring in unison. Gabriel grinned as he looked over his shoulder at Merasiël and Dane. The enraged sea buffeted the Gleaming Endeavor as the storm surged on overhead. Merasiël wrapped her legs around the cracking mast, blinking away the rain as Angrist cut through the jammed ropes holding the sails in place. Somewhere below, Gabriel floundered in the sea after being thrown overboard. She could only trust that Rainald would pull the swordsman back to safety. Triumph turned to fear as the newly freed sails fell towards one of the stouthearted seamen that served aboard the vessel. The sails caught Tully square in the chest before severing the seamen’s safety line. A large spray of water blew over the side of the ship where he had fallen and then he was gone. Merasiël barely registered that her own safety line had been compromised, and dove for Tully’s rapidly disappearing line. Merasiël dove for the shadows behind one of the plush chairs near the window. As light from the hallway filled the room, she shrank further away from it, forcing herself into stillness. The door closed, and the bright light from the sconces in the hall was replaced by the dim flicker of candlelight. The conversation ended with the sound of footfall followed by the door slamming closed. Merasiël waited still, her breath caught in her throat. The fabric beside her head whispered softly once more as Edward rose and walked to the window. Merasiël then had her first clear view of him, and she believed that if someone were to look like hell, as the humans were want to say, then Edward would fit that description. His normally clean and pressed clothing was stained in several places. His collar was undone and the hairs on the top of his head were sticking out at an odd angle. He gazed out the front window for a long while, scowling downward towards the front drive, until the unmistakable sound of a litter leaving drifted up to the window. “Ah, what a bloody mess,” he grumbled, and then turned away from the window. His eyes met Merasiël’s and both of them froze. Merasiël ignored him. “Your father’s business?” she prompted. Merasiël took a step towards the window, and Edward rose hurriedly. Merasiël nodded. “This will conclude our business, then.” She then turned back towards the window. Three days later, the sun dawned bright with the promise of a warm, late summer day. The manor bustled with preparations for the late Lord Bonet’s funeral. The transition to the new master of the house was going well, however this morning, the new Lord Bonet was notably absent, remaining locked in his study. “M’lord Edward?” The voice of Bruce, his father’s Steward, called from the other side of the locked door. Gentle raps became more insistent, and then turned into a cacophony of fists hammering against the wooden surface. Edward snored from where he had fallen asleep in his desk chair the night before. Eventually the noise woke him, and he lifted his head. He blinked in the dim light that filtered from behind the partially closed drapes, then flew out of the chair, sending several pieces of paper flying in the air. Edward looked out the window, noting with some chagrin the position of the sun and then ran for the door. When he opened it, Bruce stood there, fist raised to continue pounding against the door. Edward lowered the fork, his appetite suddenly gone. It’s done then. Am I so different from my father now? Lives can continue or come to an abrupt end at my word. And yet, the end result is worth it, is it not? “Eggs? What? Oh, no no. They’re delicious. I’m just…at a loss for words over the news.” Edward forced himself to pick the fork up and eat. “Oh yes sir, lovely young lady she is. Lady Katherine. About fifteen as I recall. Oddly enough, she must have been stricken by a fit of sleepwalking for they found her outside the house wrapped in a blanket and lying in a pile of hay. She claims someone carried her out in the night, but the guards believe she’s just upset because of her father. Shook her up quite good, but if you ask me…” he continued to prattle, but Edward’s thoughts turned elsewhere. Oh, my Lady of the Great Forest, you do have a heart buried in there. Thank you. Merasiël glanced upwards as the popping and crackling of her campfire echoed loud in her ears. It had been more than a week since the downfall of Lord Tereus, and no pursuit had come from Hyrnan. Still, she glanced around, wary of trouble. When none came, she looked back down at the paper she had secreted away. She did not know where they all were, but she would find them, one way or the other. Each name’s accusation, branded on paper, involved in slave trade. She had seen enough damning evidence. She proclaimed them guilty. Some were involved more than others, but in this, Merasiël could not be choosy. They would all eventually fall, just as Lord Claudius Bonet had. Merasiël committed each name to memory, then tossed the paper in the fire and watched the last turn to ash.